Steam generator irons usually have one thing in common. They all advertise that they can help significantly reduce your ironing time. However, while these steamers all look the same, they can vary in price by more than a hundred pounds. But are we really getting what we pay for? Which features do we really need? An iron is a simple implement designed to take the creases out of fabric. In that, it is simple, but steam generator irons took things to another level. Hot steam is a great aid to ironing, and the way the latest models use it is much more efficient than in the past. Our reviews cover all the important features such as temperature control, automatic adjustments, different settings for various fabrics, high pressure output, advanced sensors and how they can help you. Here's a summary of the features you should watch out for. You might be thinking all irons are pretty much the same. In some ways that's right, but the best steam generators have several features and settings that a lot of similar models don't have. Ease of Use – Ironing is something you want to do quickly and easily. You don't want to spend ages programming the appliance or have to stop and think about how to change setting. The best irons are often the easiest to use. Light & Smooth - Big & Bulky is out! If you're ironing a week's worth of washing, you don't want to feel like your arms are going to drop off half way through. Some models on our list have a standard 50g/min output, while others offer more but have a less controllable upper boost. You need to work out which is best for you by looking at the amount and type of laundry you will be dealing with. Coated Base – a coated or ceramic base means you get the best of both worlds with no marking and smooth operation. Price – we are frankly amazed at the prices difference between the models we featured, so set your budget accordingly and choose an iron that you can afford – and that does the job. ​​There are advanced steam irons, and then there’s this, the ultra-powerful 6.7 bar ​Philips Perfect Care Elite. ​T​h​is steam generator comes with every possible feature you can think of: it adjusts the temperature to an optimal setting automatically; it has fully variable steam output; and it is ready to iron at temperature in just a couple of minutes. ​It comes with Philips patented OPTIMALTemp technology so you don’t need to worry about setting it in advance. It's just one setting that regulates the temperature and amount of steam you need. The​ Perfect Care Elite has a generous 1.8L detachable ​water reservoir which is designed to be easy-to-fill. Taking just 2-minutes for "Steam on" you won't have to wait around to use it. It's also completely silent when producing steam, and at just 0.8kg / 1.76 lbs, it's very light to handle. An added feature I particularly like is a de-calc function for hard-water areas, as unfortunately there are a lot of these in the UK. And cleaning an iron is a necessary chore as it can ruin your clothes if you don't do it often (not to the mention the iron!). You get a two-year warranty and a 60-days money-back guarantee with this one. The big drawback with the Philips Perfect Care Elite is it's high price tag. If you are looking for the best steam generator iron that money can buy - this might be it! However, it might not fit in with your budget as well as others on our list. 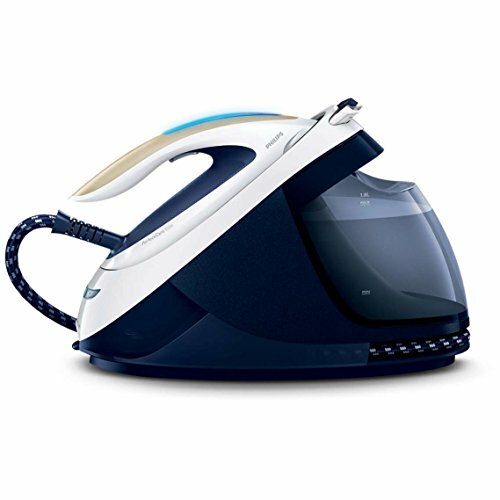 ​​The Tefal FV9788 is one of the UK's best-selling steam generating irons. In the same price category as the Philip's model above, it has a few key differences which add to it's appeal. People who hate ironing (and that's most of us!) will love it's designed to try and reduce ironing time by 50%! To do this, it uses a really high-pressure steam of 120g / minute with a 260g turbo-boost for those stubborn creases. ​This model is easy-to-use as there are just three settings to choose from - "Low" for synthetics, "Medium" for wool or silk and "High" for linen and cottons. You can also control the steam or turn it off completely depending on the thickness of the fabric you are ironing. Tefal also claim that their self-cleaning plate is the best in the world. It sounds another bold claim, but looking at the specs and explanation it just might be valid. Not only is the scratch-resistant plate designed to be long-lasting and easy-gliding, but it uses catalytic oxidation to turn fiber which attach to it into gas and steam. There is also an anti-calc collector which is great if you live in an area where boiling water produces limescale. The filter also helps prevent that horrible brown-steam that cheaper irons produce after a while. As with the Philips model, this one has a 1.8L detachable water tank capacity with a retractable cable. An important safety-feature to mention is an auto-off. This kicks in if it's left face down for 30 seconds, or 8 minutes standing up. There have been some negative comments about the weight of the unit as it's pretty bulky at 6.5 kgs / 14.33 lbs, but the iron itself is only around 1kg. The weight also makes it much harder to knock off your ironing board. In my opinion, the drawback with this Tefal model (apart from the price) is that it comes with a bog-standard 1-year warranty. For the price, it wouldn't be unreasonable to expect two-years. ​If you're after a great steam generator iron that doesn't break the bank, consider the Morphy Richards 333020. ​Naturally, there are some trade-offs to to be made with models costing​ 4 or 5 times as much. The most important two are the level of steam and the water tank. Where the "High-End" models have a 1.8L tank, the 333020 has just 1L. However, it is detachable and refillable. So if you have a small family or only a few items that need ironing it's ideal. As for the steam, you're getting a 100g /minute continuous steam output without any boosts. Again, this is much lower than the 160g / minute the more expensive models put out. It does have a water spray feature for tackling difficult creases, and also a replaceable anti-scale cartridge which is a nice touch for longer use. There is no automatic temperature adjustment, though some users prefer being able to adjust the dial on the handle. The 1.6 metre cable is not the longest we have come across, and the stainless steel plate is not treated. This means it might not be as smooth as some on our list. Still, something that is really great for the price is the warranty. It comes with 2-years included. This can be extended for another year, provided you register your product within the first 28-days. This could well be the best steam generator for the money, and it's perfect if you're looking for an entry-level model. ​Another easy-to-use steam generating iron at a great price is the Swan Sl11010N. ​​This no-frills machine is easy to set up and ready to go in minutes. ​As with the previously reviewed Morphy Richards model, this one also produces 110 g / minute of constant steam but it has a 1.5L detachable water tank - which is much bigger. A ceramic coated plate is great for no marks and getting those creases out easily – and also for longer use – while this one can also be used as a steam generator in the vertical position, too. This one also doesn't have automatic temperature settings. There is a dial in the middle where you adjust the settings and a button to give you an extra-shot of steam. There is also a generous 2-meter long cord, which is the same length as the more expensive models. You can't see it in the photo, but there is a carry handle for the unit. I actually prefer this to the lock feature that many comparable models use. One thing I don't particularly like about this model is there isn't an automatic shut-off. So you need to watch out if you leave it face down on the ironing board. Surprisingly though (for the price) this comes with a 2-year warranty from Swan. All things considered, this is one of the better budget steam generators on the market in 2019. ​Rounding out our list is this well-priced entry, the Klarstein Speed Iron. ​​​This is another cheap steam generator iron - like the previous two entries it's 3 / 4 times cheaper than the more expensive models. For the price you still get a lot of great features from Klarstein. ​​Perhaps the key stat is that this is a 3.5 bar steamer. To put that into perspective, the ultra-powerful (and much more expensive!) Philips ​PC Elite puts out 6.7 bars, so this is around half that. ​The constant steam pressure is a respectable 90g / minute, and this is helped by a directed steam shot perfect for shirt collars and jeans. It's a vertical steamer as well so it can be used on curtains and upholstery. What is quite surprising is that it's ready for u​se in just 1.5 minutes - much faster than irons costing twice as much. 1.7L allows for around 60 minutes of ironing and is more "family size". You can also fill it up in use, too. There​'s also an integrated anti-limescale filter, which is good if you live in a hard water area. It will also help the iron last longer, too. ​For the price, you can't expect a fancy soleplate, and this one has the stainless steel variety. Klarstein does say it has 68 steam nozzles, though most companies don't disclose this feature! In common with a lot of the cheaper steam irons, there is not an auto-off setting. If you don't have young children in the house or aren't the forgetful type (i.e not me!) this might not bother you though. One safety feature I do approve of is a a carry handle for the whole unit. And at 4.2 kg for both the iron and unit it's pretty light, too. ​For the money and the manufacturer's 60-day "No Quibble" return policy, it's definitely worth a closer look. ​From researching all the options available in 2018, there seems to be a clear divide between "Budget" & "High-End" when it comes to these appliances. If the price wasn't an issue the two stand-outs are the Philips PC Elite and the Tefal GV8461. ​If we have to pick one, we'd pick the Philipps. It just beats the Tefal in steam ​generation, producing 6.7 bars and 130g / minute vs 6 bars and 120g / minute. But as you can see - it was close!